Opinion: Trump fights for his wall, the US budget impasse drags on: Dr Stephen Hoadley looks at the history and effect of walls on borders around the world. 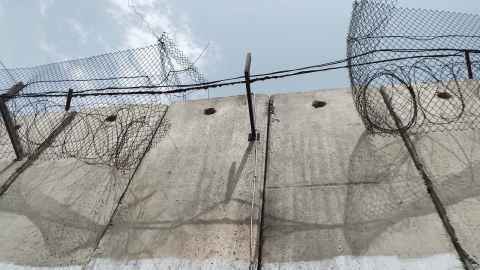 Walls between nations are growing around the world: Hundreds of kilometers of wall separate Israel and Palestine, a small section is pictured. First, to answer this question, we can look back at historical precedents. These range from the Amorite Wall in Mesopotamia (present day Iraq) in 2100 BC and include the Roman Emperor Hadrian’s Wall in Scotland (120 AD), the Persian’s Gorgon Wall (400 AD), Emperors Constantine’s and Theodosius’s walls protecting Constantinople from the late 300s till the Muslim conquest in 1453, and the Ming Emperor’s Great Wall of China (1450 AD). Each was temporarily effective in keeping out ‘barbarians’ (nomads, Celts, Huns, Muslims, Mongols, Manchurians) but all were eventually breached and rendered irrelevant. Dr Stephen Hoadley is Associate Professor of Politics and International Relations at the University of Auckland’s Faculty of Arts. This article reflects the opinion of the author and not the views of the University of Auckland. Used with permission from Newsroom A historical lens on Trump’s wall published on 23 January 2019.